I’ll admit. Chuck Wendig’s style is an acquired taste. 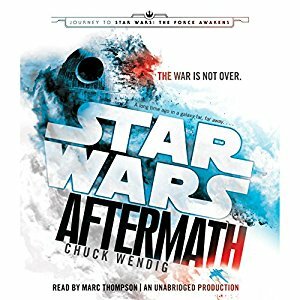 His first Star Wars novel Aftermath is written in present tense. That either works or doesn’t, with no in between on that particular writing technique. That said, Wendig writes extremely well for audio. When his prose is read aloud and coupled with the typical dramatic presentations that date back to the days of The Expanded Universe, you almost get a new Star Wars movie. And so it is with Aftermath. In audio, performed by Marc Thompson, this becomes almost comical, particularly Mr. Bones’s scenes. Bones could have been a truly nerve-grating character, but the sound affects and altered voice make him the comic relief Jar Jar should have been. “I have performed violence!” he gleefully announces after killing a squad of Stormtroopers. ﻿ There are interludes, including one with Han and Chewie, who discover a window of opportunity to boot the last Imperial dregs from the Wookie homeworld of Kashyyk. Sometimes, these work. Other times, especially when they’re characters who exist long enough for a slice of post-Palpatine life, they detract from the plot. The team itself, a mix of new and previous characters, including Wedge from the movies and Sloane from earlier novels, could easily populate a Rebels-like streaming series. Lucas himself envisioned Star Wars becoming a TV franchise, and indeed, Clone Wars handled the prequel era much better than the movies. (Even Grievous, the character I most despise in this franchise, was actually quite tolerable. A backstory helped.) Personally, I think a series with these characters would be a much better offering than the one-offs coming out between trilogy installments. Wendig’s handling of his first turn creating new Star Wars canon is rough in places, but it does move the franchise from its Flash Gordon-like origins to its HBO/Netflix/rebooted Battlestar Galactica feel today. And it’s much more fun (Rogue One notwithstanding).